I’ve developed a physical dependance on Bellwether Farms’ basket-dipped ricotta. The thick, rich cheese is the perfect combination of salty and creamy, with fat, irregular curds. I’m powerless against it. Largely, I invent recipes just so I can have it around. I put it in pancakes. I put it in gnocchi. I smear it on pizza and under carrots. And the other day, when I could stop putting it directly on a spoon and into my mouth, I put it in this dessert. Twice. Gluten-free scones had thus far eluded me, and I was overjoyed when ricotta turned out to be the answer. Among my past attempts, there was a super chewy scone made with rice flour, honey, and dried fruit. There were some savory biscuits that stayed gummy in the middle no matter how long I baked them. There were dry, chalky cobbler biscuits, and the biggest disaster of all: scone dough that melted into more of a cake batter that I baked anyway and then threw most of it away. Since scones are one of my favorite things to bake, I found this frustrating. 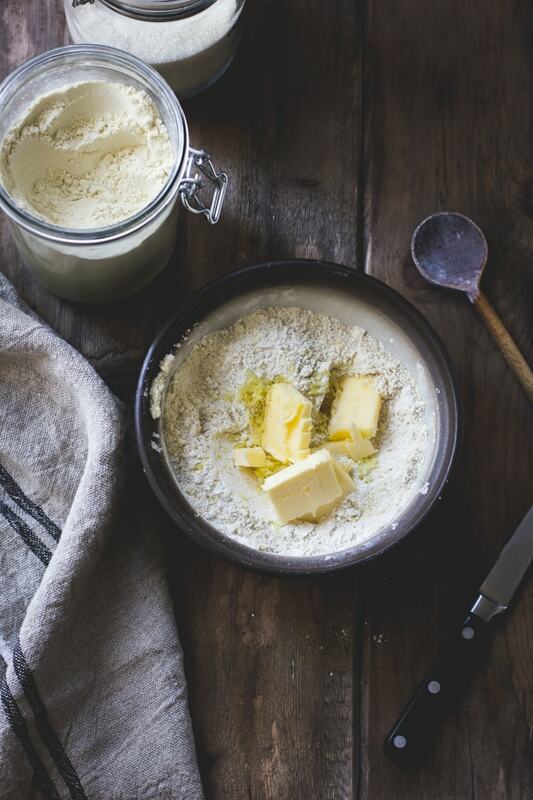 Gluten-free flours lack the protein present in wheat (i.e. gluten) that helps baked goods hold together. 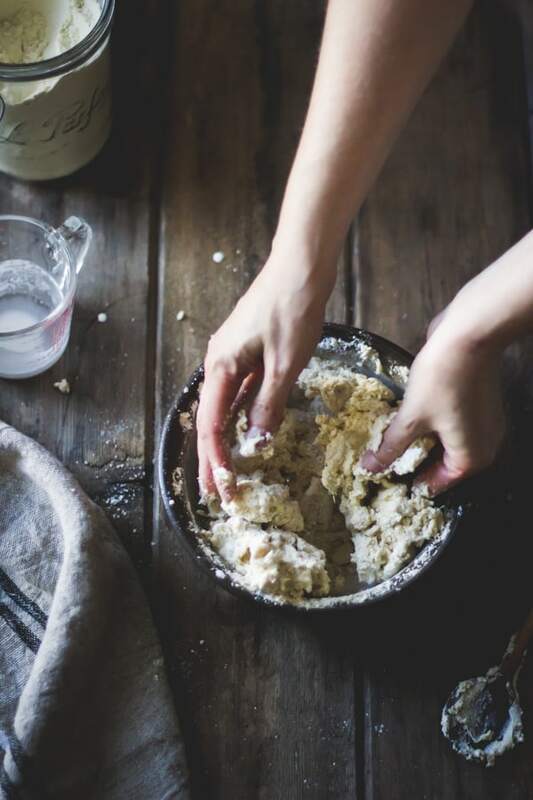 The protein is often replaced with bean flours (which have an off-taste) or nut flours such as almond (which are lovely, but make everything taste like marzipan [not necessarily a bad thing, but not always what one wants]). Ricotta added the protein needed to create a pillowy texture, while altering the flavor for the better. These are some of the tastiest shortcake biscuits I’ve ever had. 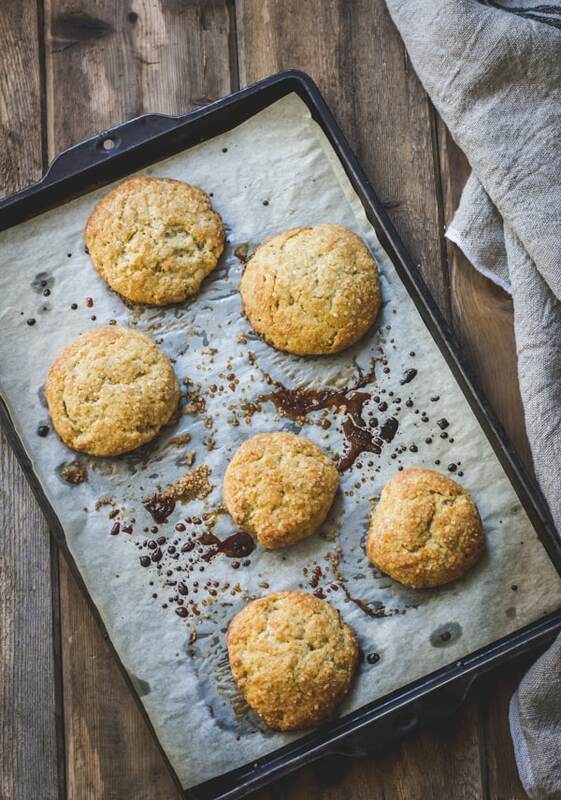 So I’m extra excited to share this recipe because not only does it contain a double dose of my favorite ricotta (in the biscuits and in the cream) but also because I finally baked gluten-free biscuits that are good on their own and undetectably sans wheat. Woohoo! It took all my willpower to let them cool long enough to whip some ricotta and cream together, macerate blackberries with honey and thyme, and assemble and shoot the shortcakes. Ok, maybe I had one or two straight from the oven. But I’m glad I had enough restraint to make these shortcakes with the rest of them. 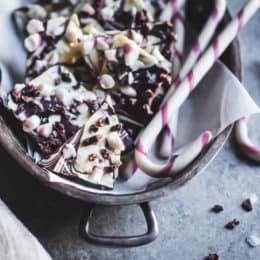 The idea for this combination of flavors came from this ice cream and it is a winner: savory-sweet, bright and deep, mild and herbaceous all at the same time. 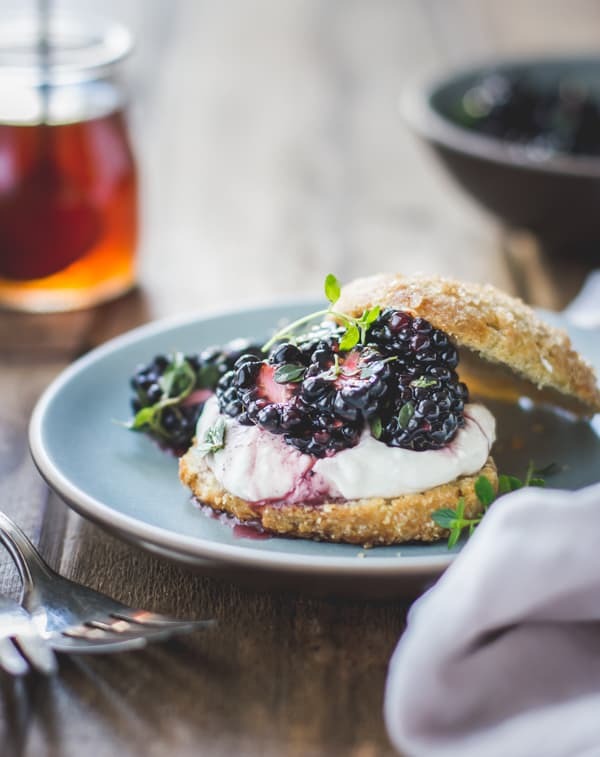 I love the contrast in textures of toasty biscuits topped with a crunch of coarse sugar, thick cream studded with ricotta curds, and juicy blackberries sweetened with blackberry honey and dotted with lemon thyme. Jay made himself one for a snack today, and later we shared one for dessert after which he said, “I could eat like ten of those.” This from the man with no sweet tooth. I highly recommend using a good quality store-bought or homemade ricotta cheese here. 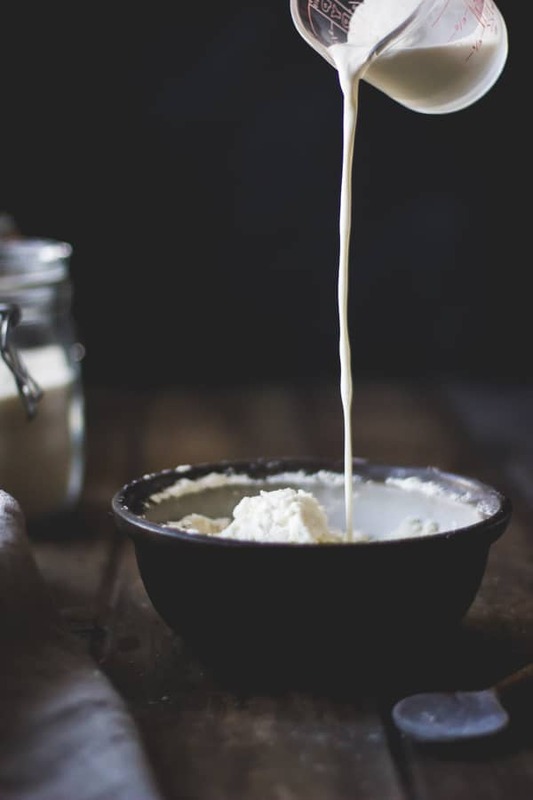 The one I love is Bellwether Farms’ Basket-Dipped Whole Milk Ricotta; I eat it by the spoonful. 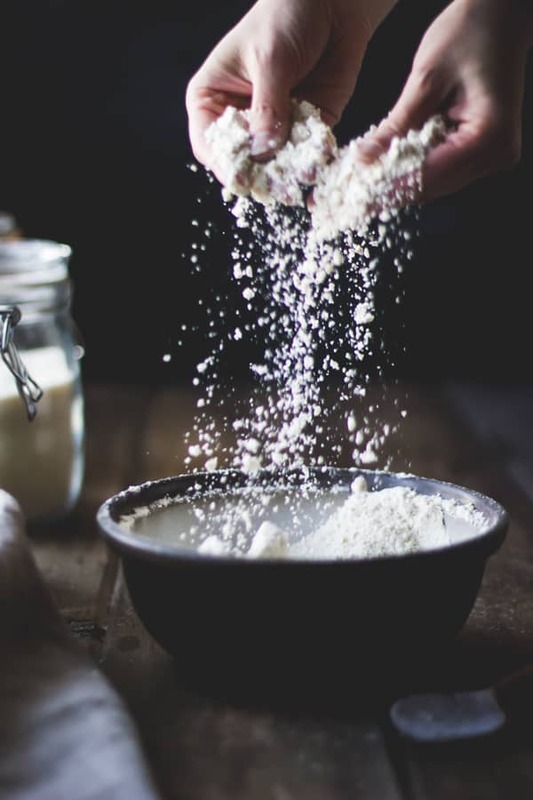 If you or your guests are highly sensitive to gluten, be sure to source certified gluten-free ingredients (especially oat flour). 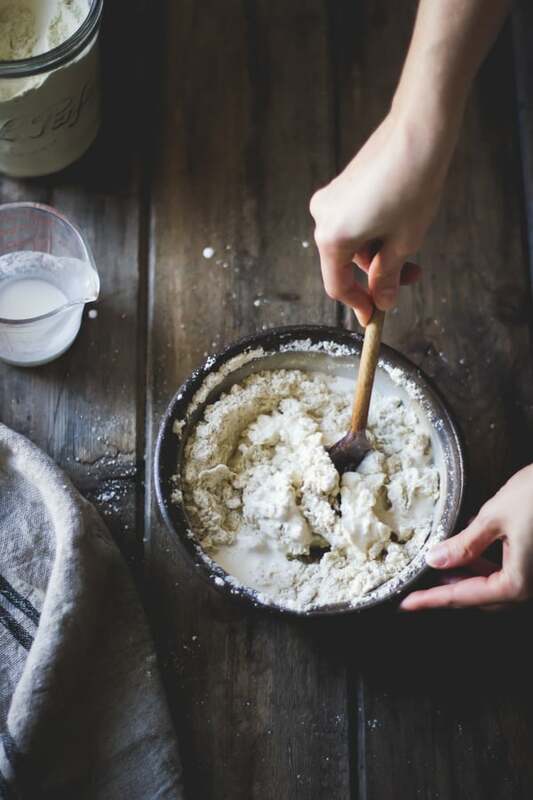 If gluten isn’t an issue, feel free to try this recipe with 1/2 cup + 2 tablespoons all-purpose flour and 1/4 cup + 2 tablespoons whole wheat flour, omitting the cornstarch, tapioca flour and chia seed altogether and adjusting the cream as needed to make a firm dough that holds together. The blackberries here are something special, but other berries or stone fruit could easily stand in. The biscuits are also lovely on their own when freshly baked, spread with a bit of jam and more ricotta. Position a rack in the upper third of the oven and preheat to 425ºF. Line a baking sheet with parchment paper. 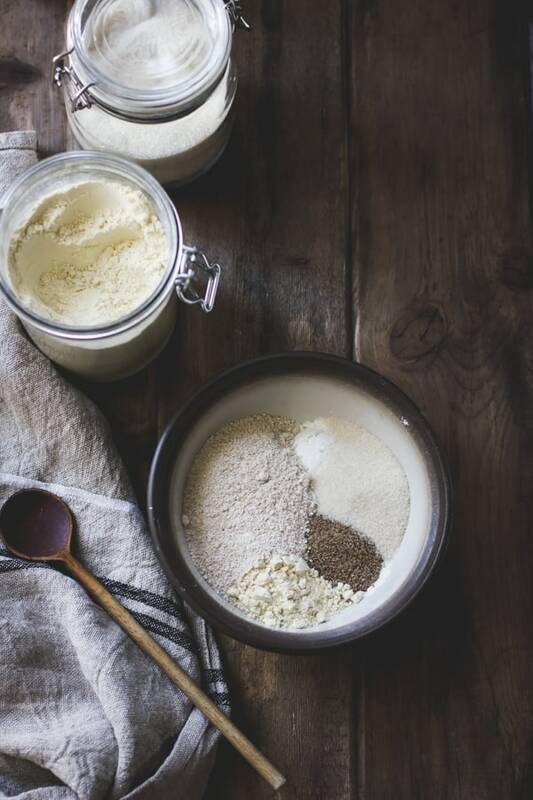 In a large bowl, whisk together the millet, oat and tapioca flours with the cornstarch, sugar, chia seed, baking powder, and salt. Add the butter and lemon zest, and rub with your fingers until the mixture looks like gravel with some pea-sized butter bits remaining. Add the ricotta and cream, and stir / knead with your hands until the dough comes together in a rough ball. The dough should feel fairly firm, but evenly moistened. Bake the biscuits until golden on top, 14-18 minutes. Let cool at least 30 minutes; they are still cooking from residual heat. 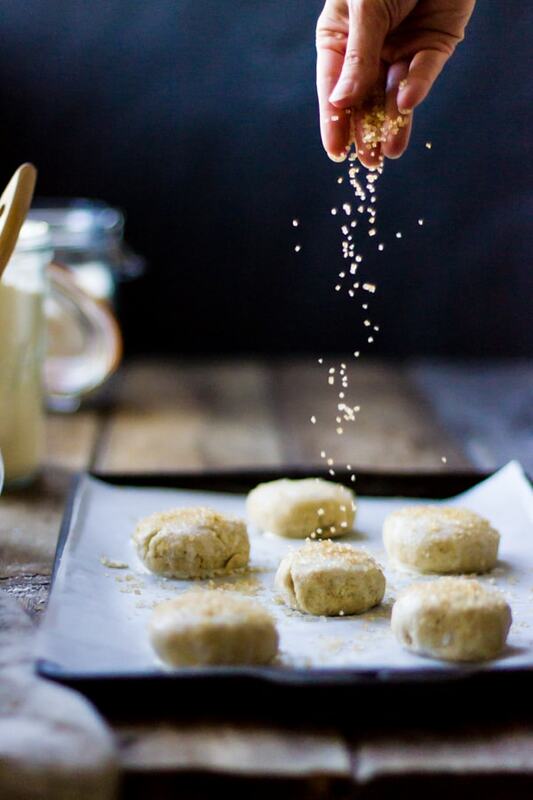 The biscuits are best the day of baking, but they will keep at room temperature for a day or two. Toast before serving. Toss the halved berries with the honey and thyme and let macerate for at least 10 minutes and up to an hour or two. 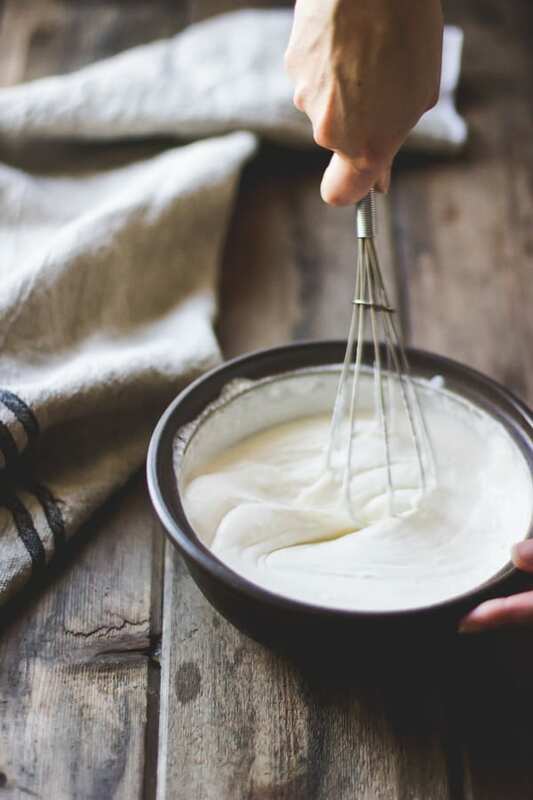 Whip the cream, ricotta, sugar and vanilla until the mixture forms soft peaks. Chill if not using right away. Slice a biscuit in half using a serrated knife. 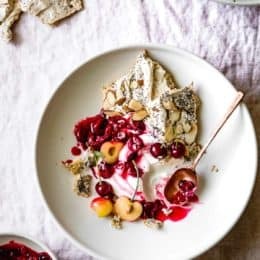 Place the bottom half on a plate, top with a large dollop of ricotta cream, and place a mess of honeyed berries on top, letting some fall off onto the plate. 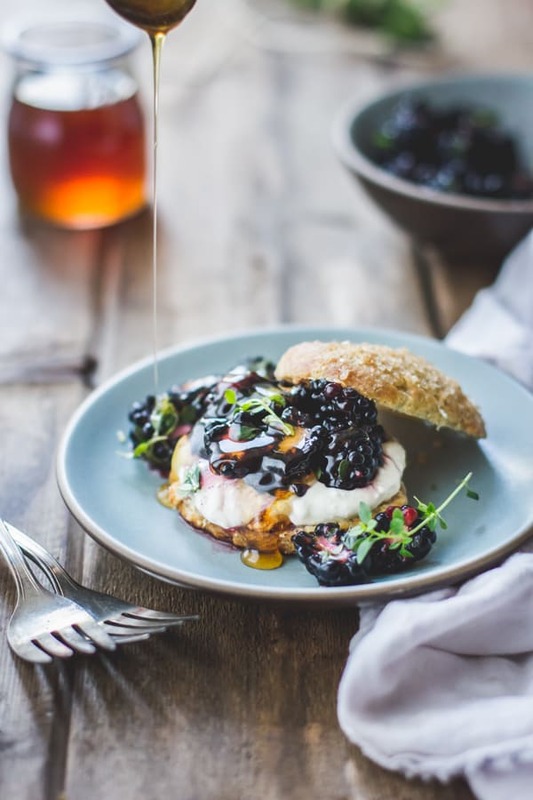 Top with the biscuit lid, garnish with a drizzle of honey and a thyme sprig or two, and serve. Blackberries.. 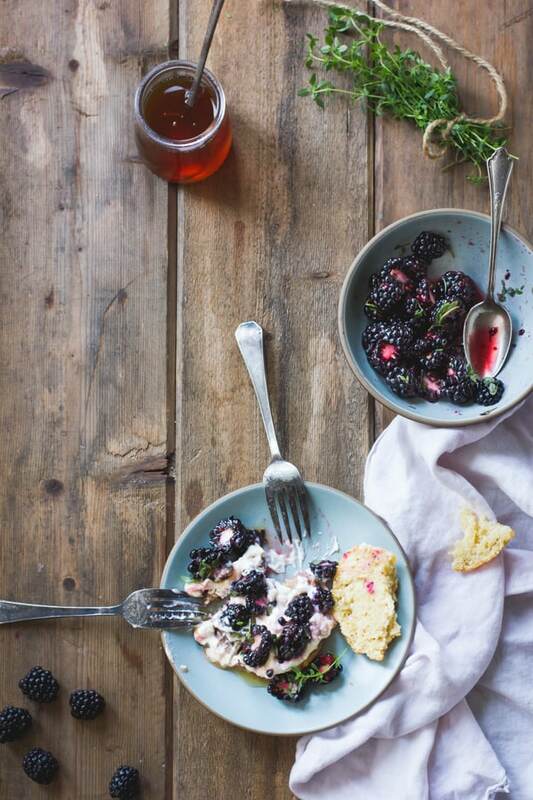 These shortcakes look really lovely and blackberries make them even better! Take me with you!! :) That snack sounds divine – I'll have to try it. 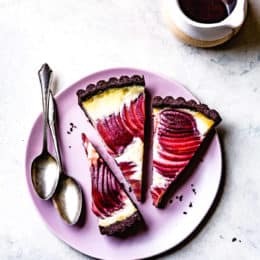 This recipe is absolutely gorgeous! Pinned! This is gorgeous. Love the flavour and the photos! Holy mama, these look positively amazing. Just painfully delectable! And the process shots are beyond gorgeous. Oh, thank you so much, Cheryl! Stunning! This dish looks absolutely scrumptious and I love the photography! Love the flavor combinations here… and stunning photos as always! 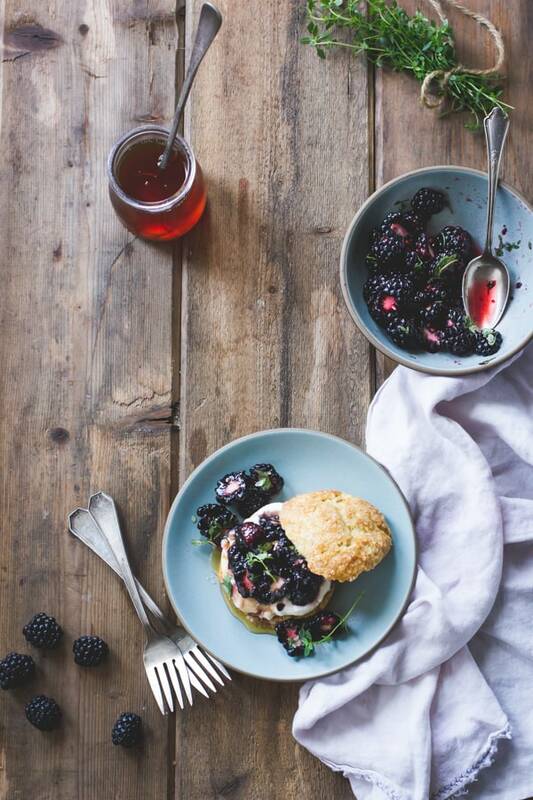 Such gorgeous shortcakes, and blackberries with thyme and honey sound like gems straight from heaven! Totally my kind of recipe and yayy for adding fresh herbs which I also love to do! Your pics are stunning and wondered if you have help with the action shots or do you rely on timer? Thanks Gerry! Yes, I love savory herbs in sweets. I do use the timer on my camera – it's too much fun. Ah wow! Congratulations on gluten-free biscuits. That is a HUGE accomplishment! And the ricotta is the perfect way to celebrate! These shortcakes look absolutely DIVINE. I'm kind of over here just staring at your photos – I discovered your blog tonight and it's definitely going to be on my continue to visit list!! Girl, your action photos are fabulous! I'm so jealous of your mad skills! This recipe looks SO good! Aw thanks Elizabeth! That girl is on fire! Gorgeous! 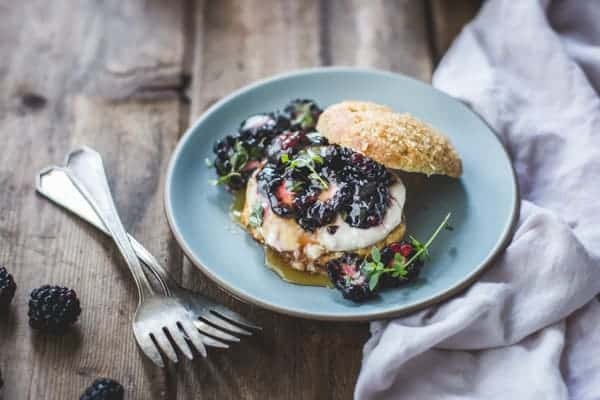 This is the season for shortcakes and this one is a stunner! Thanks, Jessie! Currently drooling over you peach shortcakes – yum! definitely guilty of repinning these images too many times. beautifully captured alanna. I LOVE ricotta and can also eat it with a spoon. I never thought to use it as a binder for GF breads, but now I'm definitely going to be trying it. Cheers! 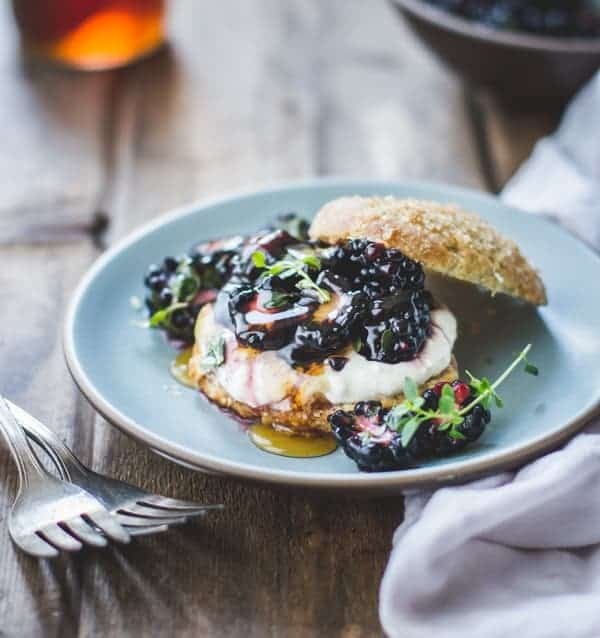 Just discovered your gorgeous blog… this looks absolutely amazing!! Oh, thank you so much for the sweet note! I hope you and your family love the biscuits (I wish my family had scone and cream teas!). 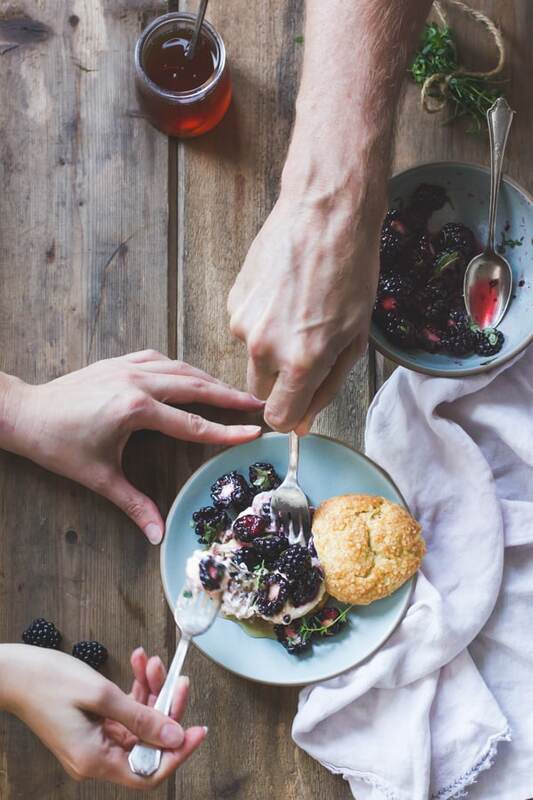 These scones look perfect – especially when paired with those sweet blackberries, cream, and honey. I've never thought to add ricotta to my gluten-free baked goods (or chia seeds, actually!). These are bound to make a brunch appearance very soon. 1) These sound amazing (hello ricotta!) 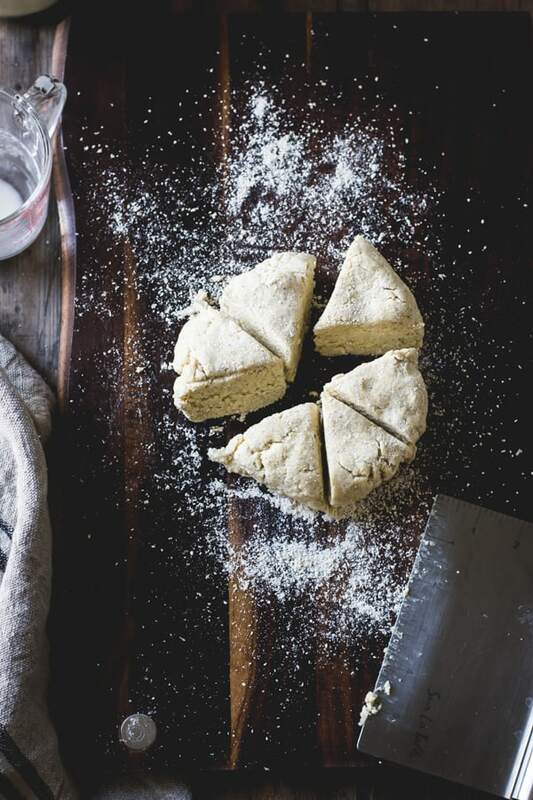 2) These look amazing (your photography never ceases to amaze me) 3) "Yay" for mastering gf scones! 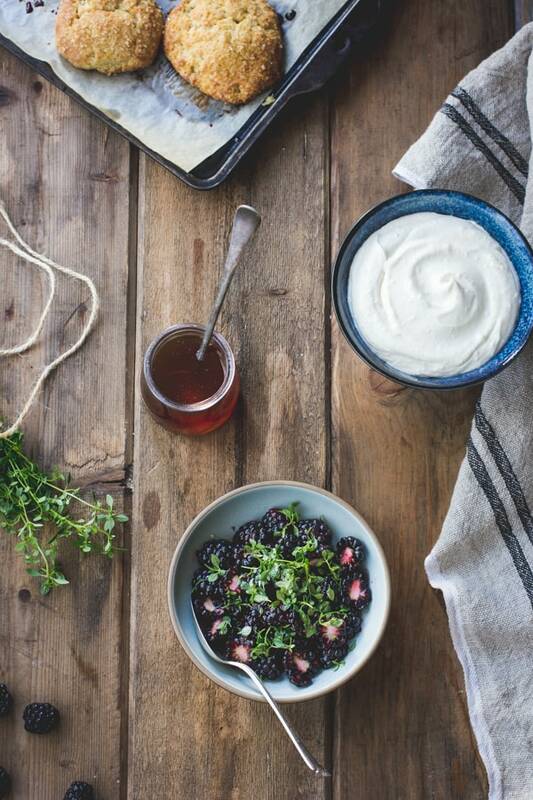 I love absolutely everything about this recipe (ricotta = best thing ever) and I'm totally blown away by your photographs; just simply stunning. Thank you so much for saying so, Kathryn!